There are three books in the world which I would class as absolute favourites of mine. Ashamedly as I am studying English Literature, none of these are classics, but are books which I feel are beautiful and enjoyable to read. They are (in no particular order as choosing them is akin to choosing a favourite child) 'Water For Elephants' by Sara Gruen, 'The Time Traveller's Wife' by Audrey Niffenegger and 'One Day' by David Nicholls. All three of these have been adapted into successful films. I have to say I was bitterly disappointed by the cinematic offering of 'The Time Traveller's Wife' to the point where anyone I know who has seen the film but not read the book, I urge them to do so immediately as the book is 1000 times better. But with the other two I felt the film versions were pretty amazing. With 'Water For Elephants' this came as no shock. It involved watching Robert Pattinson for 2 hours with no mention of vampires or werewolves - in my eyes it couldn't go wrong. One Day however I was slightly apprehensive about. I had loved the book so much, felt a personal connection to the characters and it had become part of my world to the point where I couldn't imagine someone else deciding what characters should look like and sound like. I felt even more cynical when I learnt that the role of Emma would be played not by an English actress with a Yorkshire accent but by Hollywood star Anne Hathaway. Don't get me wrong I love Anne Hathaway but I was sceptical as to whether she could be convincingly northern. I have to say though that within 10 minutes of the film starting all of these misgivings disappeared. 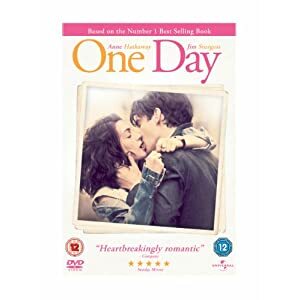 I was engrossed and felt that, although changes were obviously made, the film had a true sense of what I loved so much about the book; its Britishness, its ability to be heartwarmingly romantic without ever feeling overdone or cheesy. I particularly thought that Jim Sturgess made an absolutely perfect Dexter. I know that I am by no means the only person to have read and cherished this book. If you have not yet had the pleasure I would strongly recommend picking it up. I doubt you will regret it. And if you are, like me, slightly afraid of film adaptations spoiling a well loved read I would recommend you try this one. I think it really does do justice to the novel in a way I did not expect.